As Hermine continues to menace Florida’s northwest coast, it officially crossed over into hurricane territory this afternoon. That makes this week rather special: Florida is about to get smacked with its first hurricane in more than a decade. For those who don’t live in the Sunshine State, the words “Florida” and “hurricane” might feel rather synonymous. But for the past 11 years, the state has enjoyed a record hurricane-free streak. The last hurricane to strike Florida was Wilma, which made landfall on October 24th, 2005. Hermine, which intensified from a tropical depression to a tropical storm late yesterday, continued to strengthen into a hurricane this afternoon, according to data from the Air Force Reserve’s Hurricane Hunter aircraft, which clocked sustained maximum windspeeds of nearly 75 mph (120 kph). While that barely nudges Hermine into Category 1 territory, it doesn’t always take a high-powered hurricane to do a lot of damage. As weather and climate news site WXshift notes, Sandy was a Category 1 at landfall. In other words, the hurricane warnings and watches that have been rolling in all day should be taken very seriously. 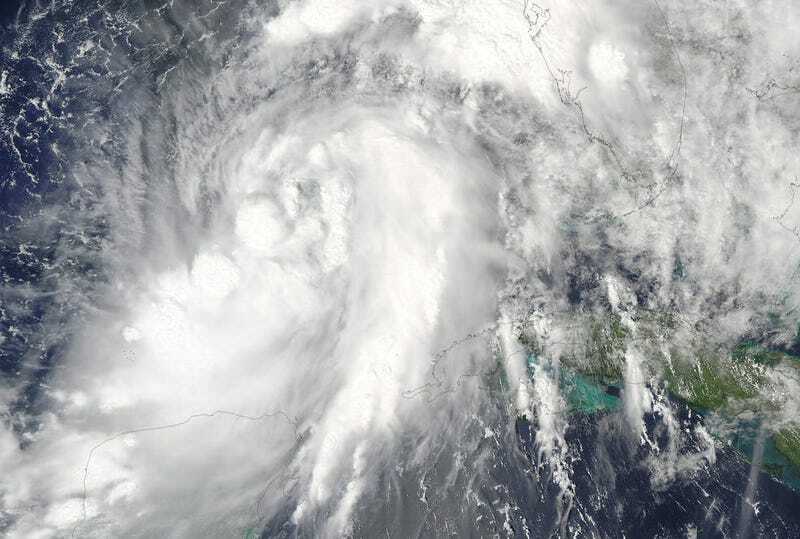 Governor Rick Scott has already declared a state of emergency in 42 counties in anticipation of heavy rainfall, fierce winds, and storm surges of up to eight feet into the Labor Day Weekend. Rainfall accumulations of 5 to 10 inches are expected for northwest Florida and southern Georgia through Friday, with an additional 4 to 8 inches of rain anticipated for parts of eastern Georgia and the Carolinas as the storm moves up the coast. “These rains may cause life threatening flash flooding,” the National Weather Service warns. I’ll leave you with a menacing view of the beast captured by NASA’s GOESS satellite this afternoon. Stay high and stay dry, folks.